Pipe: How’s your hell dear? On an island in central Stockholm, next to the idyllic Skansen area and its picaresque surroundings, lies the art venue Liljevalchs. One cold and dark December afternoon (it is Sweden after all), I finally made my way to the much talked about exhibition Helvete (which means Hell in English). In the exhibition Hell is described as “sometimes hot and passionately wild, sometimes intensely penetrating straight to the pain spot”. The show touches upon the themes of death, ‘doomsday’, war, racism and Satan; with varying connotations on Hell as its central subject matter. The exhibition penetrates the individual with the help of a wide variety of both national and international artists, including Francisco de Goya and Cindy Sherman. Even though the show does includes many renowned artists I find it quite hard to see the “sometimes hot and passionately wild” side of it. A lot of Helvete’s content is both thrilling and memorable, but the exhibition lacks spark. I get the overall feeling of a slightly fragmented show with the subject hell being the only clear focus. It should be important that for any exhibition to be deemed a success, it must convey a strong sense of togetherness. In doing this, the viewer must get the impression that all the pieces’ in one room belong to the same exhibition, and connect with the ones in the next space. In Helvete this unity is somewhat vague, and every so often I feel rather lost. The exhibition may be a brave attempt at mixing old and new but it still lacks a coherent overall harmony. The different works include media such as photography, painting, film, modern sculpture and light installations. For me however it doesn’t quite work, as many of the rooms lack a unified thematic balance; and some of the works are considerably weaker than others. Francisco de Goya’s fantastic etchings “The disasters of War” have their own space, and even if I am a huge admirer and clearly can see their strong connection to hell, they do feel slightly out of place in this otherwise relatively contemporary show. We are encouraged to walk through Helvete as it was illustrated in Jacques Callot’s The Temptation of St Anthony (1635). A beautiful blow-up theatre has been built solely for the exhibition, but it fails to engage me. Perhaps I would have felt different if I had seen one of the four dance performances of La Furiosa that were held there in the autumn. I can’t help but wonder why this installation is not in the nearby dance museum instead though? As separate pieces most of the work in Helvete is intriguing and the exhibition presents a diverse selection of art, which is clearly of a very high standard. I found myself falling in Love with Sun Xun’s fantastic animations as well as Glenn Brown’s The End series, which is dedicated to Ian Curtis. Disregarding the lack of harmony there is something quite intriguing about the varied selection of work presented in Helvete. At times I do enjoy myself and the show gets tighter and more unified towards the end. Maria Misenberger’s evocative photographic series Sverige/Schweden leaves me feeling distraught and uncomfortable. This feeling follows me into the last room, in which all the pieces are created by Roj Friberg for the exhibition. 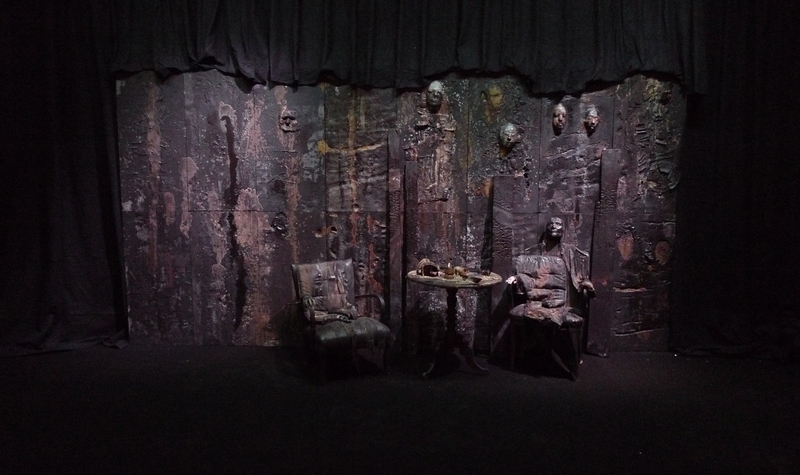 Friberg’s paintings are painfully engaging and surrealistically intriguing and they fit well together in his naked and burnt out installation. After I left Helvete I realise that even though it wasn’t the most clearly defined exhibition I have seen, it will certainly be one I remember. In retrospect I feel that Helvete is a brave attempt to combine diverse artists and their media in an exhibition space.